This is National Financial Literacy Month! It is time to take control of your finances. Decide today, that you are responsible for your financial future, make better financial decisions, differentiate between wants and needs, get out of debt, start a savings account, track your expenses, start budgeting, set and achieve goals. If you are happy with your situation, don’t change! If not, read on. Unless someone else is responsible for you, you have to take care of yourself financially. Getting started is easy, get the things you need or missing. It may be skills or details. Before you can track your expenses, you need to know what they are. It is similar to losing weight, you need to know what you eat before you can do something about it. I know a lot of you are very uncomfortable with budgeting or handling your personal finances. Start small and carve out a small success! Start with an expense diary to become familiar with how you spend your money. Take one expense and lower your cost. Build on that success and attack the other expenses. You can lower your expenses for groceries, household expenses, student loans, loans/debt, utilities, insurance, transportation, telephone, home repairs, rent/mortgage payment and entertainment. Tracking your expenses and evaluating each expense will help you learn more about your spending. Taking responsibility for your finances individually or for the family is important! Someone has to be in charge and it might as well be you. You and your partner should agree on your goals. What goals take priority in your life? Maybe it is saving for your first home, children, children’s education, vacation, retirement or debt reduction. Whatever the goal, you need to make it a priority in your budget. A budget is a structure to help you achieve your financial goals. Where do you start? Take what you spend every month and determine if you spend too much or just need to reorder your priorities. You can use Google Docs for a budget template and fill in the blanks. One of the advantages of using Google docs is you can access it anywhere and make changes. It is a great way to monitor your progress. Break all your long term goals into daily tasks. If you want to accumulate a million dollars, you need to establish a daily/weekly/monthly target otherwise you will never achieve it. Reward your success! Many goals take years to achieve so find ways to celebrate milestones or periodic successes. It is the best way to stay on track. It is easy to stray and get off track when goals take years to achieve. Small celebrations or rewards help you achieve more. For example, you pay off a small loan, do something to reward you. It does not have to cost money; it could be a day at the beach or something else you enjoy. Overcoming inaction, hurdles or difficulties is not easy. You may need to learn new things to achieve these goals. Knowledge is important and you can get almost all of it online. There are some great personal financial blogs, books, articles and articles that you can access anywhere. It is similar to changing your eating habits by learning new recipes. If you like the information, you are more likely to use it and make it a habit. Remember this is the start of the process and you need to keep improving and learning. Financial literacy just takes a commitment! A commitment to learn the skills you do not know and apply them to your personal finances. I tried to make it simple by attacking tone item at a time. Most people think it is too difficult to control your finances. Keep it simple don’t try to do everything at once! Look for small tasks and make a change. Small successes work too. Learning what you don’t know is the first step! 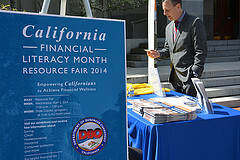 Start now it is National Financial Literacy Month. The good thing is once you get started on your path to financial literacy and taking responsibility for your finances, things get easier! Meaning, one you learn how to budget, plan, save, etc. then it becomes more second nature. Taking these steps leads to a much easier and better life. Financial literacy is so important, and I agree with Peter, once you start it just gets easier. There is so much information out there now, there’s really no excuse to not know the basics. Absolutely! I think many people are scared off because they think it is too complicated. I think everyone should just start with the stuff they do understand and add as needed. Real estate is still my favorite because you have more control! You find the deal that makes and work on improving value. The stock market is less hands on, but less control too. Both have one similarity, it is hard to find that home run. In the stock market, I like biotech although it is currently a little battered. There are always deals of varying value in real estate, you just have to look for it. Financial literacy is really important, and far too many people simply don’t have it. To the extent that parents who have such skills can teach their kids, it can be such a big benefit to the lives of the kids. I view that as being a responsibility of mine. Funny, how we eat and use money every day and seem to know so little about it! I was always fascinated with money and made a career about it. I enjoy eating and learned what is good for me. Maybe that is the key, learn enough about money to do well.